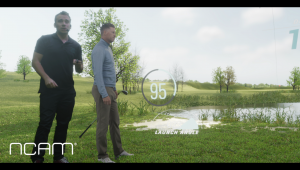 Ncam, which offers a complete and customisable augmented reality (AR) platform that enables photorealistic virtual graphics in real time, is staying focused on the sports broadcast industry and its needs by renewing its SVG Europe Gold Sponsorship. Phil Ventre, VP Sports and Broadcast, Ncam, said: “Sports broadcasting is constantly pushing technological boundaries to bring its audiences insight and information in innovative and engaging ways. As a member of SVG Europe, we are able to stay up to date with industry developments and participate in discussions around the challenges facing sports producers. “SVG Europe’s events offer fantastic opportunities to meet and build relationships with sports production professionals, to share our augmented reality expertise and innovations, and develop ideas together that will enable them to deliver incredible AR content to their viewers,” Ventre added. Ncam Reality enables virtual production through real time camera tracking, providing live previsualisation of environments, set extensions and CGI elements directly in-camera whilst shooting. Its camera tracking solution offers a massive leap forwards in camera tracking capabilities with unrivalled accuracy, robustness and ﬂexibility combined with autonomous operator free functionality. Ncam recently achieved the first ever example of a wireless RF Steadicam position being deployed to enable live, real time AR graphics with marker-less camera tracking. This groundbreaking innovation was proven on one of the world’s most-watched sporting events, the 2019 Super Bowl. By opening up the possibility of this type of limitless tracking, broadcasters can embrace the opportunities of what can be achieved now that untethered AR is becoming a reality, the company stated.